I went to the London Super Comic Convention yesterday, where the high point for me was the Jack Kirby panel in the afternoon. 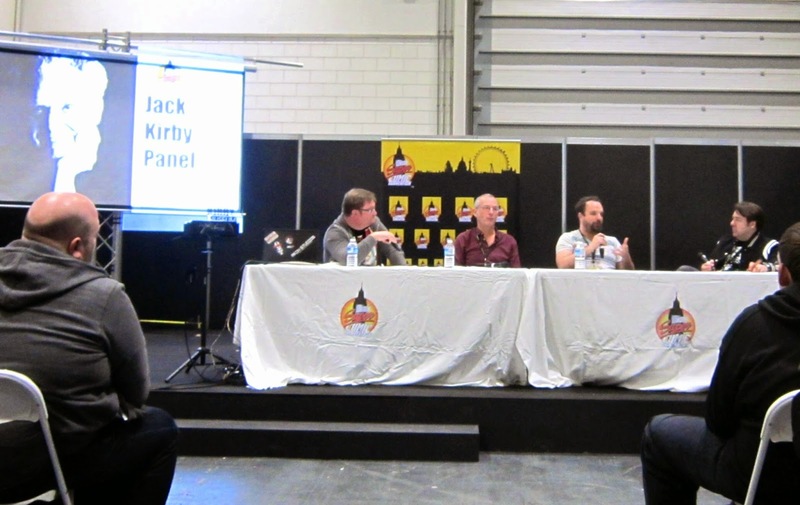 This was hosted by Russell Payne of the online Jack Kirby Museum (on the left in the picture above), and included two of British comicdom’s best known figures: Dave Gibbons, co-creator of Watchmen, and TV personality Jonathan Ross. Sitting between them is a younger American creator named Tim Seeley. Having been a Kirby fan since the 1960s, I found the panel a fascinating mix of nostalgia and insight (a lot of the latter coming from Jonathan Ross – which may surprise people who only know him from TV, but he really is very knowledgeable and eloquent when he gets onto the subject of comics). Not everyone has heard of Jack Kirby, but everyone has heard of the comic-book characters he helped to create. The Wikipedia category Characters created by Jack Kirby has no fewer than 308 entries, including Captain America, the Fantastic Four, Thor, Loki, the Hulk, the X-Men, Ant-Man, the Red Skull, Peggy Carter and Groot. Some of his creations had a distinctly Fortean flavour, as pointed out by a Forum writer in Fortean Times a few years ago (FT277, July 2011): “Kirby’s science fiction series The Eternals (originally entitled The Return of the Gods) was inspired by Erich von Däniken’s cosmic conspiracy tome Chariots of the Gods.” And one of my own very first blog posts was about Kirby’s “Face on Mars” story from 1958. Sooner or later any discussion of Kirby’s creations is going to zoom in on one highly emotive issue: he didn’t own any of them. This is particularly tragic in Kirby’s case, because he created so many characters who are central to modern popular culture – but the same is true of any comic creator of his generation. It was the way the industry worked in those days: an artist was paid a flat fee to create heroes and villains, which then became the property of the company they worked for (Marvel, in the case of all the characters I’ve mentioned so far). That’s completely different from the way prose literature works, where the author retains ownership of any characters they create. But there’s a flip side to this, which had never occurred to me until Jonathan Ross pointed it out yesterday. I’m going to have to be careful how I say this, because it may come across as a defence of corporatism, which it absolutely isn’t. Of course Jack should have retained ownership of all his creations, and of course Marvel should have paid him a royalty every time they reused one of his characters in a subsequent comic book (or more recently, in a blockbuster movie). That way Jack would have been a richer and happier man in his old age, and justice would have been done. But if that had been the case, history would have unfolded differently. If Marvel had to pay royalties every time they used Captain America, or Thor, or the Hulk, they wouldn’t have used them anything like as much as they have done. The amazing way that Jack Kirby’s creations have been continuously recycled and reinvented for new generations would almost certainly never have happened. You can’t just point at Groot, for example, in the Guardians of the Galaxy movie and say “Kirby’s family should be getting royalties for that” – because if that was the legal situation, it probably wouldn’t have been Groot in the movie but a newly created character. If you name a Marvel superhero, there’s a good chance Jack Kirby had a hand in the creative process. But that’s not the case with Marvel’s chief rival, DC comics. It’s true that Kirby did create plenty of characters for DC – a whole sub-universe known as the Fourth World – but they’re not the well known ones. Everyone has heard of Superman and Batman, but only comic-book geeks have heard of Darkseid and Orion. The convention yesterday was overflowing with cosplay Poison Ivys and Harley Quinns, but there wasn’t a single Big Barda in sight (much to my disappointment). Jonathan Ross offered the view that Star Wars is basically a plagiaristic rip-off of Kirby’s Fourth World saga. I’ve come across this theory before, and I’m not convinced by it. There are parallels, of course, but it may be more a case of “great minds think alike”. As Tim Seeley pointed out, it’s known that George Lucas consciously based Star Wars on Joseph Campbell’s monomyth – and it’s likely that Kirby was unconsciously digging into the same source material. Out in the main hall, I studiously avoided all the expensive dealers and focused my attention on the bargain bins. I managed to find the two Kirby-era Marvel comics pictured below for the incredibly low price of £2 each. 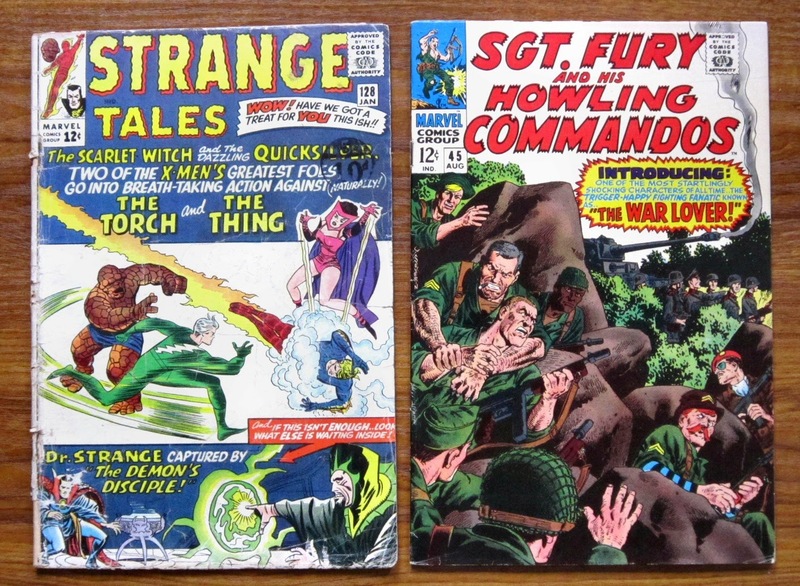 The one on the left, Strange Tales #128, is in fairly battered condition, although it’s complete and unmarked. The cover is by Jack Kirby, and it also has one of the Ditko Dr Strange stories I wrote about a few months ago (it even includes the original of the Dr Strange pinup, my version of which featured at the bottom of that post). The other £2 comic is Sgt Fury and his Howling Commandos #45 (with art by John Severin, although the character – an early incarnation of Nick Fury, later of S.H.I.E.L.D. – is yet another Kirby creation). It’s in just about as perfect condition as you can get for a 1967 comic. Thanks Brian - I managed to miss that when you posted it yesterday. Did you send it to the Metro yourself, or did they pick it up from Twitter? I didn't see Loki myself, although I did see a very convincing Red Skull and a less convincing Dr Doom. Not everybody has heard of Jack Kirby ?? Shame on them. I first saw Kirby's art on the Fantastic Four in 'Mighty World Of Marvel' in 1975. I didn't buy (or even see) any DC comics so his DC characters are a mystery to me. I thought Star Wars was supposed to be a rip-off of the Fantastic Four - that's what I've read anyway. I was referring to the world at large, Colin, not comic book fans. A hit movie probably reaches a thousand times as many people as even the best-selling comic book, and most movie goers are probably completely ignorant of how many characters were created by Kirby. I can't really see the connection between the FF and Star Wars. The connection with the New Gods is slightly clearer (although not necessarily cause-and-effect, as I said). The father-son relationship between the hero and the villain, and the Source/Force are the most obvious ones. Jack knew the score going in, and he and Joe Simon ran their own company, Mainline, the exact same way. By creating (or co-creating) characters for Marvel, Jack ensured a lot of work for himself, from which he made a better than average living. Back in the day, companies had to own the characters or else it wasn't worth publishing them. Imagine spending a fortune to launch a comicbook, only for the creator to take it to another publisher for a better deal once it showed signs of being a success. Once Kirby had left his Marvel characters behind, it was because Marvel continued to publish them that nurtured their potential value for exploitation in other media. Had Jack owned the characters, there's no guarantee that, without Marvel behind them, he'd have been able to profit from them in the way that people seem to imagine. Wasn't much of a businessman anyway. The fact is, he sold his characters in line with the custom at the time for a wage cheque, with no thought as to whether they'd be of any future value outside of a 15 cent comicbook. Much like someone selling the family silver for what it's worth at the time, then complaining when he sees the new owner on Antiques Roadshow 20 years later being told that it's now worth 100 times more than he paid for it. 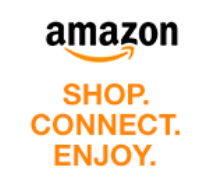 I can understand Jack's bitterness, but it stems from him selling something for less than it later became worth, but wasn't when he sold it. Sour grapes, essentially. Sad, but such is life, my friend. That issue of SGT. FURY that you bought looks quite interesting; it features the "trigger-happy fighting fanatic known as THE WAR LOVER!" I always enjoyed Sgt. Fury. Thanks Ross - I'm looking forward to reading it, both for the story and its nostalgia value. It's the same general time period as the first US Marvels I saw on newsstands here in the UK back in 1968... and pretty much the same near-mint condition too! Thanks Kid - I've come across that argument before, but the subtlety I'd always missed was the fact that "Kirby properties" wouldn't be worth very much at all today if he'd retained ownership of them, because Marvel comics and movies of later decades would have used different, brand new creations instead. Another aspect that should be considered, Andrew, is how much of the current 'value' of Kirby characters (or anyone's characters, come to that) is as a result of what later writers and artists did with them, as opposed to what he himself did. It's like Bob Kane 'creating' Batman - would Bats have been the success he later became if it hadn't been for Bill Finger's involvement? Or Denny O'Neil's or Neal Adam's? Surely they all played a major part in keeping the character alive? Okay, they'd have had nothing to work with if Kane hadn't come up with the original idea, but something else would've filled the void, as you suggest. Yes, that's another good point, Kid. Would later writers and artists have the freedom to redefine and recreate characters if they'd remained the property of the original creators rather than the comic book companies? Modern incarnations of the FF and Thor still owe a lot to Lee & Kirby, but that's less true of the X-Men or the Hulk, where critical elements were added by later creative teams. Really wanted to watch the Kirby panel but didn't anticipate so many people wanting to take our photo on the way. I was a Dr Doom (but hopefully not the less convincing one), my son was Nova and my wife was Lady Sif. The likes of Jack Kirby had a massive impact on my early years (I'm 41) and we the consumers owe him a great deal. If anyone finds a video or full transcript of the panel I would really love to hear it. Thanks Malcolm - sounds like you enjoyed yourself anyway! I was about a third of the way back in the audience, and there wasn't anyone in front of me who was recording the panel, but let's hope there was someone further back! Yes, films could be made with new characters not created by Kirby... and the film-makers would have to pay royalties to the creator of the new characters in the film. ITV decided to make a series of mystery dramas featuring Poirot rather than a new character, even though they had to pay royalties to the Agatha Christie estate. One has to assume that this made money for them, despite having to pony up to the Christie estate, as they repeated the process more recently with Miss Marple. Yes, that's a good point T. Once a character is established in the popular imagination, I guess it becomes worth paying for. The only major Silver Age comic creator I've seen in person is Roy Thomas, who spoke at an event in Bristol... I was going to say "a few years ago", but when I looked at the date stamp on my photos it was 2006! He recounted an anecdote I'd already seen in other places, about how he wanted to do a comic-book version of Conan but initially assumed they would have to create a clone, until he discovered Marvel could just about afford to pay royalties on the original character.